“I can’t go away/make that doctor appointment/spend much time at the neighborhood party. I’ve done nothing on my dissertation and I don’t deserve to do anything else. Have you said things like this to yourself? If so, you’re a typical academic. And your life is seriously out of balance. 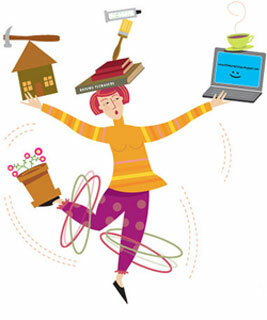 Why do academics lead unbalanced lives? You can never do enough. The academic life is a writer’s life, only worse. This is because the academic constantly feels that he or she has not done enough. This unpleasant feeling is partly caused by a system that insists that teaching and service are the most important aspects of getting tenure, while what really matters for getting tenure is publishing. And of course, the tenure process itself breeds uncertainty, fear, and paranoia. There is always someone better than you. Academics constantly compare themselves to each other. This invidious tendency to compare and find oneself lacking stems from early academic success. Used to being at the top of the class, future grad students and professors learned early on to get pleasure and a sense of identity by comparing themselves to others. Once they got to graduate school, they realized that there were others at least as smart and capable as they were. And face it: no matter how good you are at some aspect of a profession or field, there is someone else who does another part of the profession better. Ironically, this mindset is common among those who have the “luxury” of a lot of free time; such as graduate students who aren’t required to be in a lab on a daily basis, professors on sabbatical, or professors during summer break. I often hear from professors at the end of a sabbatical who are feeling desperate because they wasted all that free time by frittering it away procrastinating. In the long run, this is no way to live a life. You will end up with health problems and not enjoy your career, if you don’t balance your life better. There is more to life than academia! On the other hand, I’m not suggesting that you shouldn’t work on your career. I am suggesting that you work smarter, not harder. Recently, I helped a graduate student client who has the “too much time” problem. Despite my exhortations to spend a reasonable amount of time daily on writing, and then to engage in behaviors that were relaxing, fun or important, she just didn’t feel she “deserved” to do them. So we created a “Balanced Life Chart.” You can download it here, and also download a sample Balanced Life Chart, to give you an idea how to fill it out. In this chart, she gets points for the various activities the she had not been engaging in enough, such as socializing, writing, non-writing academic work, exercising and house cleaning. She even got points for “life maintenance.” We also included a section of the chart where she could define and give examples of each activity or task. She created both daily total point goals and weekly total point goals. Then we created a reward menu: a list of the weekly rewards that she would get if she earned certain numbers of points for each week. We played with the point system over the weeks until she found a reward level that worked to motivate her. It worked like a charm! She is now writing on a daily basis, making progress on her dissertation, and also enjoying her life more. If you don’t write enough, and also don’t spend enough time on the things that matter in life, try the Balanced Life Chart. Tweak yours to meet your needs, and let me know how it goes!